The Mid Autumn festival mooncake promotions are still underway, where eateries and restaurants everywhere are showcasing and selling their mooncakes. 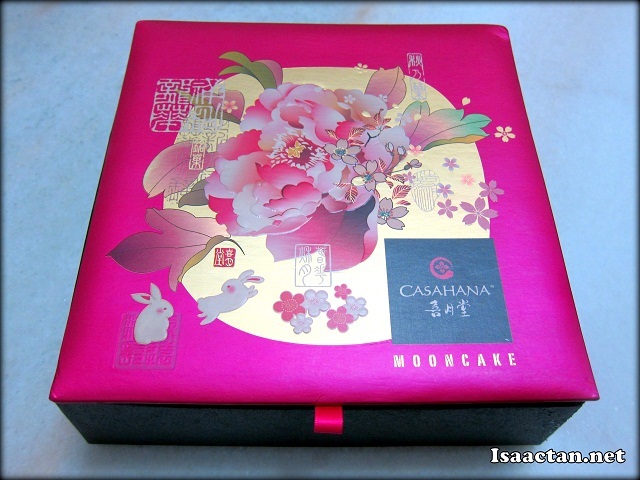 I had the chance to be given a box of Casahana Mooncakes to try out while I was back in Penang a couple of weeks back. This would be a short writeup on these mooncakes. Now Casahana Mooncakes aren't new in the market, as I have seen it so many times in prominent shopping malls. It was my first time tasting it though, as I've always stuck with my favourite few brands over the past few years. This year, Casahana came out with a new set of mooncakes with some really exotic flavours. 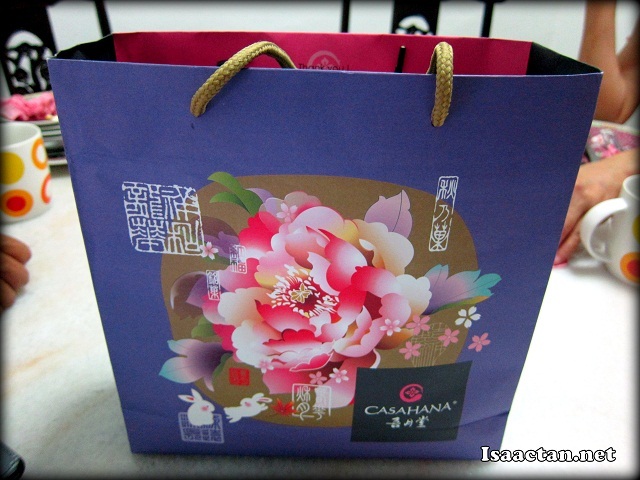 Inside the really colourful purple mooncake box, there were four different new flavoured Casahana mooncakes inside. We had the new Fiery Phoenix mooncake, the Night Symphony mooncake, the Tropical Tango, and my usual favourite, the Lotus Paste with Egg Yolk Mooncake. 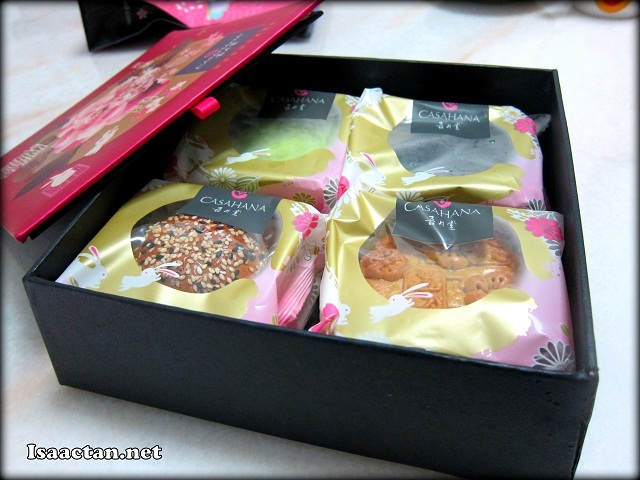 I actually gave away the other three exotic flavoured mooncakes to my parents in Penang, which they have yet to try. 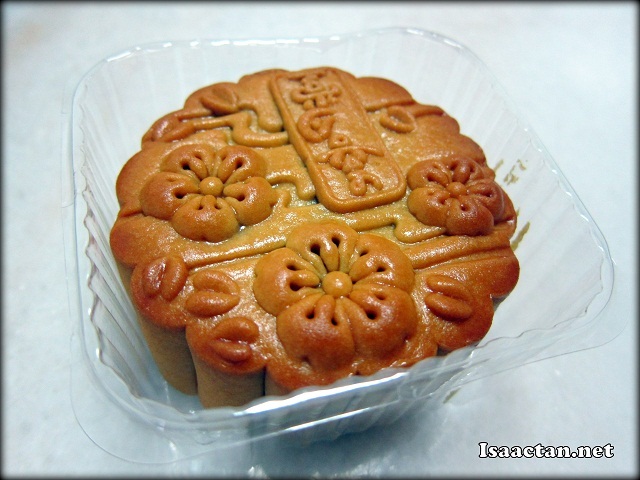 As for me, I'm always a fan of the traditional Lotus Paste Mooncake. One is never enough, Casahana's Lotus Paste with Egg Yolk Mooncake was exactly what the doctor ordered. It was pretty good, with the filling being sweet, but not overly sweet, with a delicious egg yolk hidden inside. For more information, do visit www.hytfood.com, www.facebook.com/Casahana or call 03-78055339. Hehe, i did not actually manage to try the others yet :(, will try it soon though when I'm back to penang again next week! Agree wit not too oily mooncake as it gives a greasy feeling. 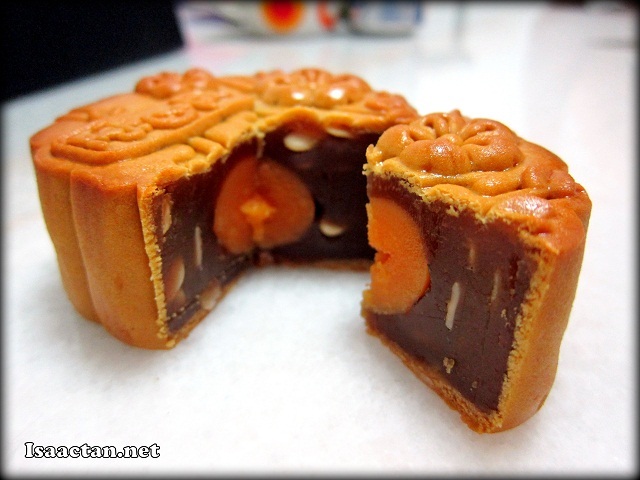 However this mooncake look jus alright to me no extra shiny spot in the pic.. I am still waiting. You have my mailing address, haven't you? Got reserve one pcs for me mou? hehhehehe...Happy Mooncake festival!